High-performing SiHy matched with superb visual consistency. With the combination of advanced material and Optimized Toric Lens Geometry, the same design features as proven Biofinity® toric, Avaira Vitality™ toric contact lenses are great lenses at a value that your astigmatic patients are looking for. Optimized Toric Lens Geometry features uniform horizontal ISO thickness, a wide ballast band, plus a larger toric optic zone. This multifaceted design quickly orients the lens for better performance and simple fitting. 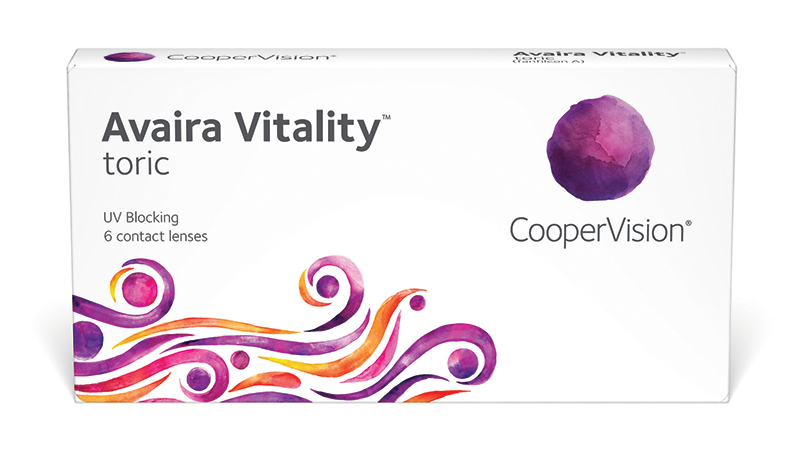 Avaira Vitality toric was demonstrated significantly better on-eye stability4, initial comfort and lens handling5 as compared to ACUVUE® OASYS® for Astigmatism. 2. With higher oxygen permeability than hydrogel materials, silicone hydrogel contact lenses minimize or eliminate hypoxia-related signs and symptoms during lens wear. 3. Based on manufacturer's published data. Avaira Vitality toric has a Dk/t of 90 at -3.00D. Compare with hydrogel toric FRP Soflens® toric for Astigmatism at 16, Vertex toric at 17.9, and Frequency® 55 toric at 15.7. 4. At both dispensing and after 2 weeks. 5. After 2 weeks of wear. As compared to ACUVUE® OASYS® for Astigmatism. This toric lens design is multifaceted to ensure optimal visual acuity, lens stability, fit and comfort. Its uniform horizontal ISO thickness and wide ballast band quickly orient the lens for better performance and simple fitting.